Hostel Fontana kohteessa Praha, Tšekki: Varaa nyt! Hostel Fontana ask Security Deposit of € 100,= for each room that you reserve. Its NOT allowed to use alcoholic drinks inside the rooms or public areas of the hostel. 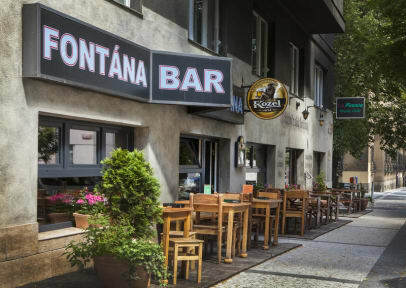 The newly renovated Hostel Fontána is a good, friendly and affordable hostel, which is located near the center of Prague, in a really nice residential neighbourhood. The Hostel is reached easily from the Airport, Coach Station, or Main Rail Station. Close to the Hostel there are a large number of cultural monuments, shops, restaurants, cafes, bars local theatres and music clubs. Just a 15 minute walk from the Hostel Fontána is Prague Castle with Cathedral St. Vitus, Palace gardens, Loreta, Malostránské Square with Saint Nicholas Church and Charles Bridge. About a kilometer further on the other side of the river Vltava is the original Jewish Quarter, where you can discover synagogues and the historical Old Jewish Cemetery. Prague is a beautiful, inexpensive and really great City to visit. The nearest public transport stop is just a 3 minute walk from the hostel, which takes passengers to the city center in 10 minutes via tram lines 5, 20, 26 or metro line A. The Hostel is easily accessible from the airport, train and bus stations. HOSTEL FONTANA now has four 8 bedded mixed dorms plus one 6 bedded mixed dorm. All rooms are non-smoking and are with shared facilities. In the common room you can watch satellite TV, or access free WiFi within the entire Hostel area. Sorry we do not have a kitchen, but there is a kettle for hot water. Our front desk is open from 08.00 until Midnight and provides tourist information on the various Prague cultural sites, transportation, shopping, nature activities, sports events, entertainment, historic sites, museums, galleries, exhibitions, and festivals. We also during the summer period organize our own Hostel nights out, visiting Historical sites, Czech bars and places of great interest. CHECK OUT IS AT 11.00 Please note there is a €3 charge for late check out. Payment is in cash only, and you can pay in CZK, or EURO . IF YOU EXPECT TO ARRIVE AFTER MIDNIGHT YOU MUST PLEASE CONTACT THE HOSTEL BY EMAIL IN ADVANCE. We can then make arrangements to be here for you on your arrival time. If you are arriving by car you will appreciate the free parking available in front of the Hostel and the surrounding areas. Have a happy stay with us…. From the terminal ( T1 and T2) take Bus No. 119 to the stop ' Nádraží Veleslavín' Then take metro 2 stations to stop ' Dejvická ' . You are now in Vítězné náměstí - walk around the round-about, and on the right side you will see the Pilsner restaurant 'Kulaťák ' (located on the corner with the street Československé armády) . Now turn right onto the street 'Československé armády ' , after 80 meters, turn right and you are on 'NÁRODNÍ OBRANY ' . Walk half way down Narodni Obrany and look on the right side for number 13. Take the metro - line C in the direction 'Haje' to the station ' Museum ' . At Museum, Change to the A green line, and go to the station ' Dejvická. ' You are now in Vítězné náměstí - walk around the round-about, and on the right side you will see the Pilsner restaurant 'Kulaťák ' (located on the corner with the street Československé armády) . Now turn right onto the street 'Československé armády ' , after 80 meters, turn right and you are on 'NÁRODNÍ OBRANY' . Walk half way down Narodni Obrany and look on the right side for number 13. Take the metro - line C in the direction 'Haje' to the station ' Museum ' . At Museum, Change to the A green line, and go to the station ' Dejvická. 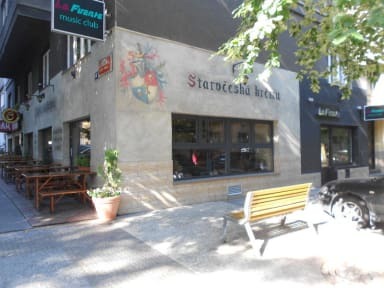 You are now in Vítězné náměstí - walk around the round-about, and on the right side you will see the Pilsner restaurant 'Kulaťák ' (located on the corner with the street Československé armády) . Now turn right onto the street 'Československé armády ' , after 80 meters, turn right and you are on 'NÁRODNÍ OBRANY' . Walk half way down Narodni Obrany and look on the right side for number 13. I had booked beds from a mixed dorm with my boyfriend, but even when I showed my booking receipt of mixed room, they separated us to different rooms which was really annoying since there wasn't even any living room where we could have been together and we couldn't go to each other's rooms because they were for men/women only. The staff were rude and impolite but only to me, maybe they were racist about my arabic last name or just misogynist. Poor lockers. No kitchen, only fridge.